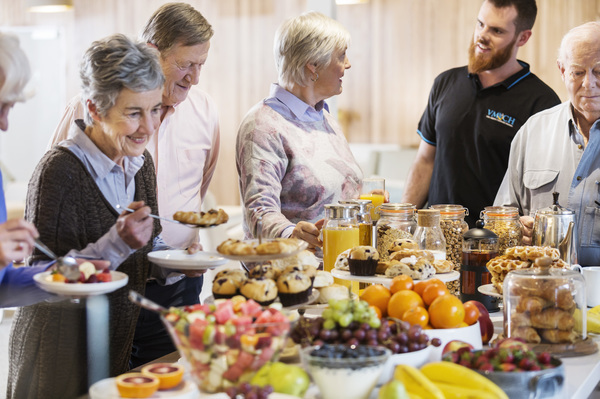 Villa Maria Catholic Homes' Hospitality Residential and Retirement Services Manager, Wayne Wallis, says food plays an important role in a person's health and happiness in aged care. Villa Maria Catholic Homes’ (VMCH) hospitality residential and retirement services nanager Wayne Wallis says food plays an important role in a person’s health and happiness in aged care. He is also leading the adoption of the Montessori practise to food services in VMHC’s 12 aged care dining rooms, which includes VMCH’s Star of the Sea Residential Aged Care at Torquay. Montessori is traditionally associated with early childhood education. In aged care it aims to empower individuals to be as independent as possible; to have a meaningful place in their aged care residence and have more choices. VMCH has introduced some fundamental changes to the way food is traditionally looked at in residential aged care. Wayne says the practice is about giving residents more choice and involving them more when it comes to mealtime. The Montessori model moves to a buffet-style dining room. The advantages of the buffet include residents having more choice in the foods they want to eat, when they eat and the size of their meal. VMCH’s 12 aged care communities are all at different stages of introducing the Montessori buffet-style dining room. Another important component of the Montessori model is empowering individuals to remain independent. People who have been preparing meals for themselves and their families for decades often go into aged care and their skills and enjoyment of this task can be overlooked and lost. The Montessori model encourages residents to get involved in mealtime. Chopping up vegetables, helping fold napkins, set tables and help others are all things that residents enjoy getting involved in. Learn more about VMCH’s aged care residences and the Montessori practice in aged care by calling 1300 845 526.